Pity the poor people who do not live in railroad towns. They miss the fun of sitting at a crossing and watching a freight rumble past. If you get bored waiting, you can always take up the challenging task of trying to read — or at least to guess at the meaning of — all the spray paint on the sides of the cars. In the case of those ancient cars that still bear the markings of the Southern Pacific, deciphering the faded taggings is almost like an exercise in archaeology, isn’t it? The Portand & Western recently completed construction of the “Santiam Lead,” a state-aided project to build a short section of track to enable its freights to avoid entering the Union Pacific mainline. (The train in this Wednesday afternoon video is on another part of the line.) The word from ODOT Rail, via Ron Irish at City Hall, was that the new crossing signals on Main Street had been inspected and the railroad was to start using the new track soon. 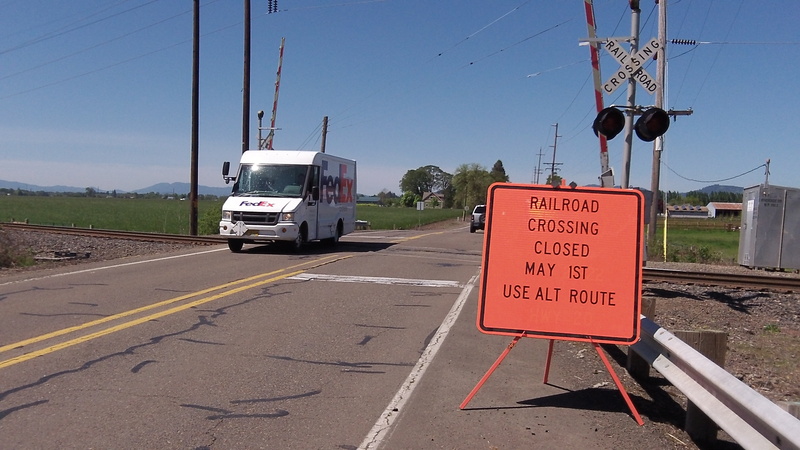 Meanwhile, it looks as though the PNWR plans to rebuild the Riverside Drive crossing on the old Oregon Electric line on May 1. At least that’s what the signs said Wednesday. The crossing can use the upgrade. It’s pretty bumpy, especially on a bike. Nice catch with both the specially painted Oregon State and University of Oregon chipracks. BTW, do you remember that this crossing had a wig-wag signal about 30 years ago?